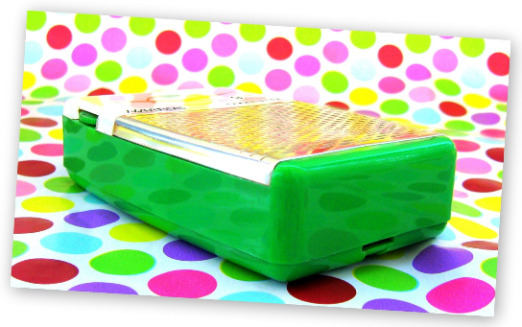 A portable revolution in your shirt pocket! 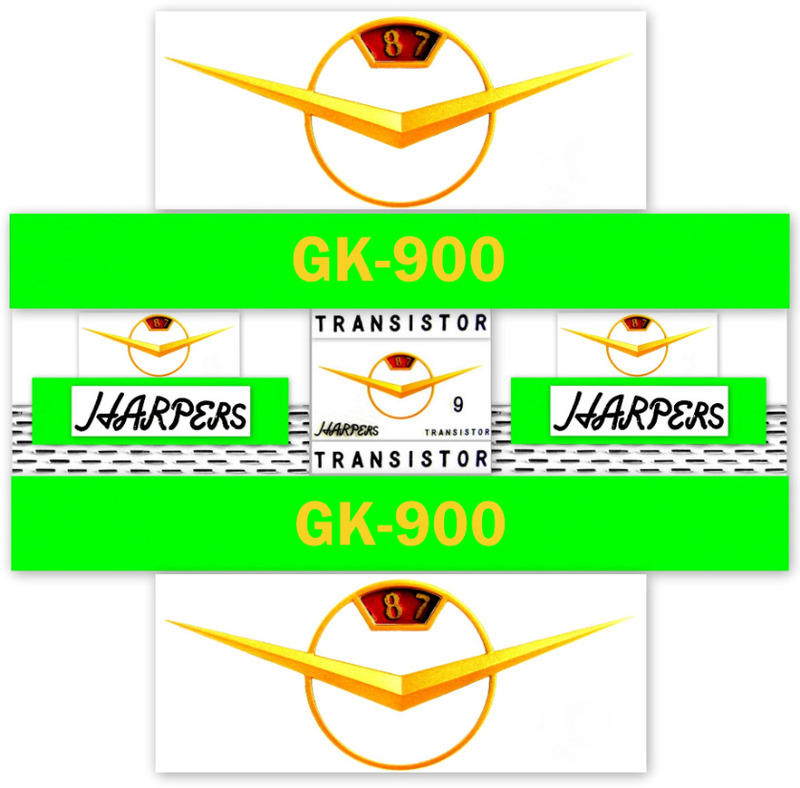 This superb Harpers GK-900 was manufactured in Japan in 1960 for Harpers International Inc. I am unsure who manufactured it. It is a very desirable radio and shares much in common with many beautiful Crown radios of the same era and it may have been made by them. However it may also have been manufactured by Sharp. 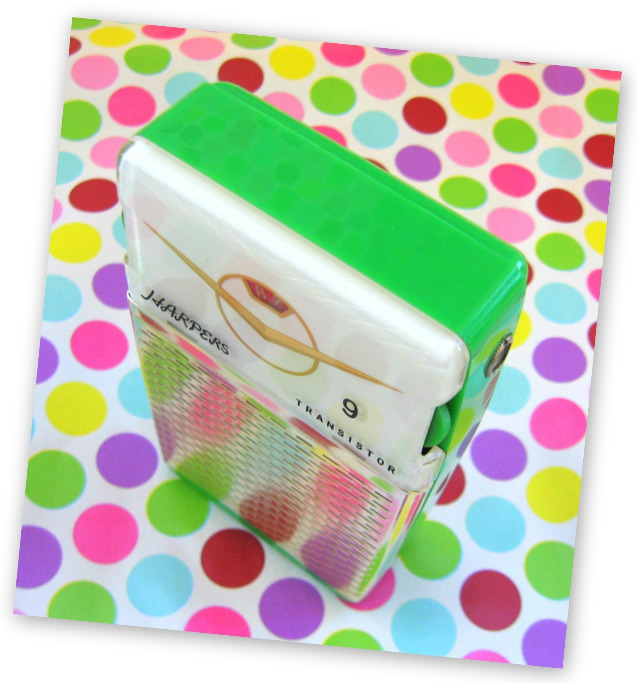 In 1958 Sharp released a small 4 transistor pocket radio. 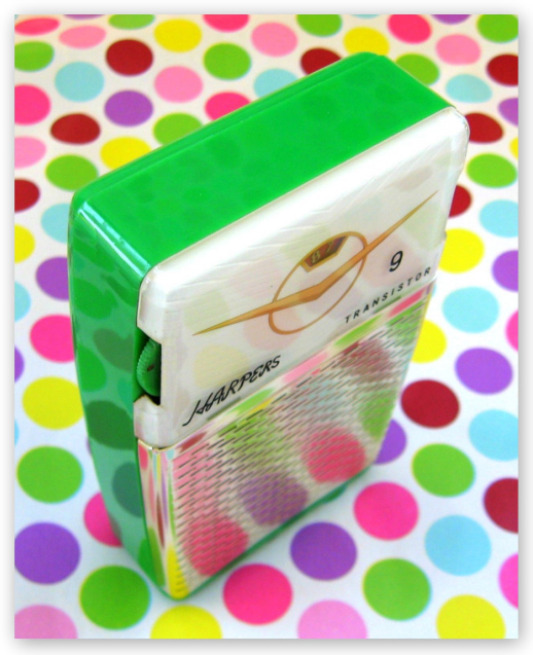 The TR-208 was branded as Harpers but it can also be found under the names Continental and Suntone. 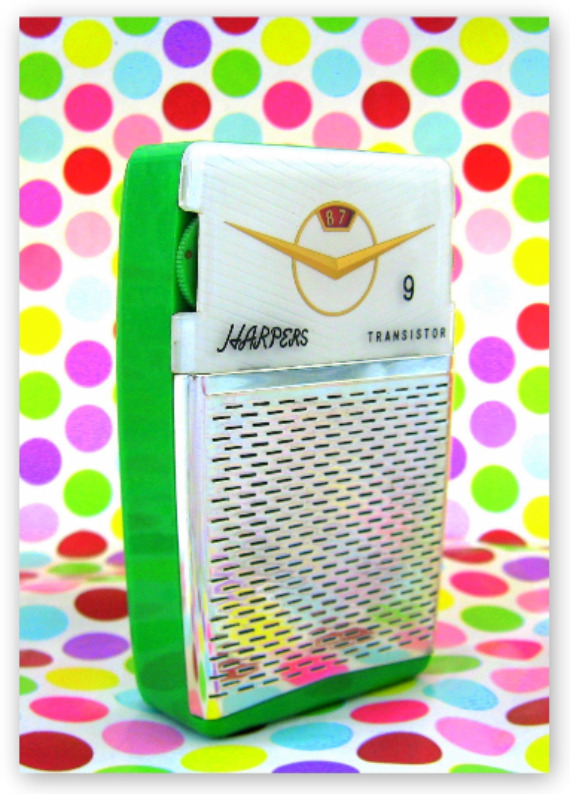 Around the same time Sharp released two horizontal transistor radios, the TR-210 and TR-221 were both branded as Harpers and Sharp. 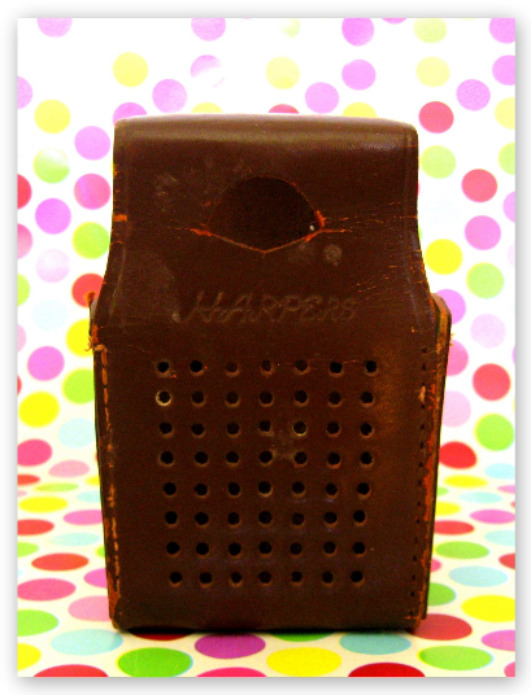 Probably predating these radios by several years was a Japanese tube portable, the Harpers GK-501. I have also seen a small Harpers electric tabletop tube model. 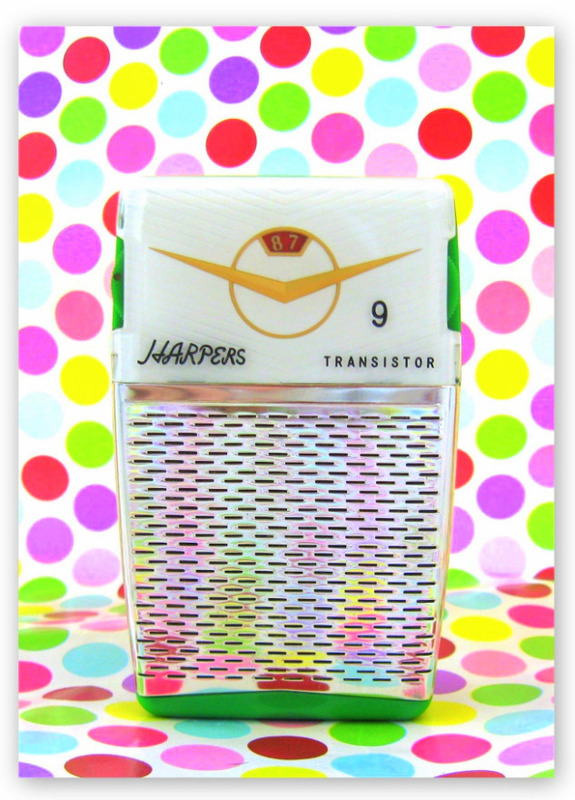 Harpers International Inc also distributed an interesting 1 transistor earphone only model, the 2TP-110 dates from the late 1950?s. "It has many of the earmarks of the big Crown 9's: TR-911, TR-999. Uses two penlights too, like those Crowns. Same dial/knob configuration. Same easel stand and mount. Same big mounting screws/washers inside. And there were other Harpers models made by Crown. As you've already mentioned, some of the Crown-made and Sharp-made models are very very similar. I mention and show this in my Continental book as regards the Continental TR-632 and the Crown TR-670." 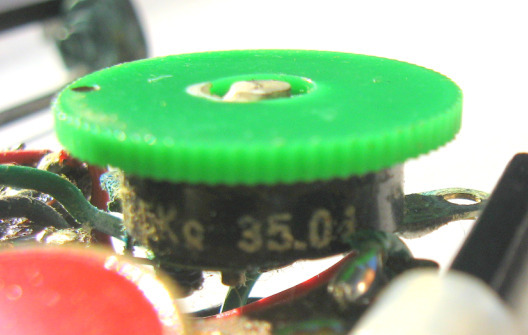 Another clue that points towards either Crown or Sharp being the manufacturer of this radio is the partially obscured model number on the circuit board starting with TR-... Most Crown model numbers started with 'TR' as did many Sharp model numbers. Many Harpers model numbers started with GK (GK-600, GK-631, GK-200, GK-301, GK-831 GK-501). 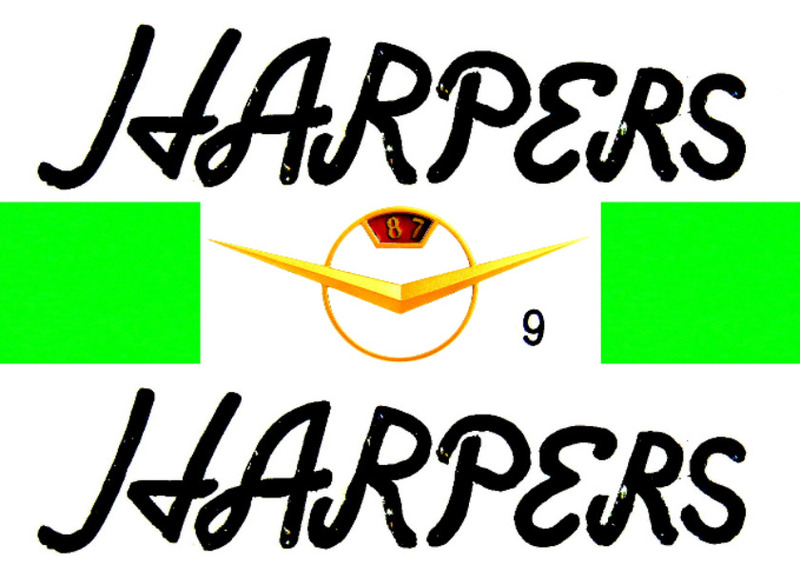 This Harpers GK-900 is housed in an uncommon bright green cabinet and features a delicate under-painted face with offset pin stripes, a bright gold chevron and a red and gold tuning dial. 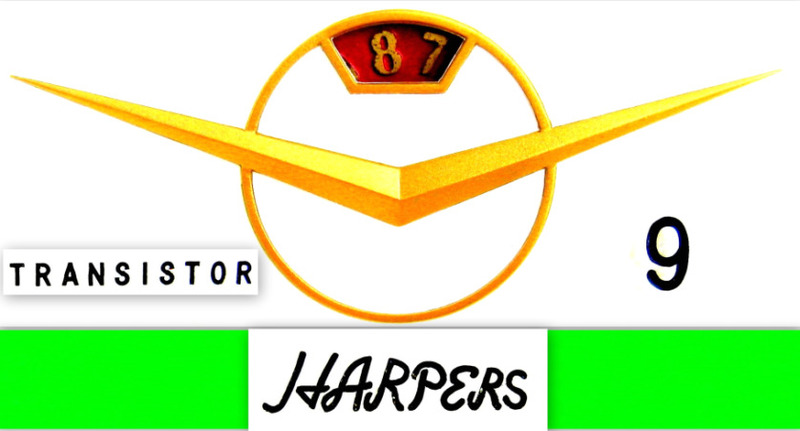 Harpers is written in quirky script that tapers towards the end. 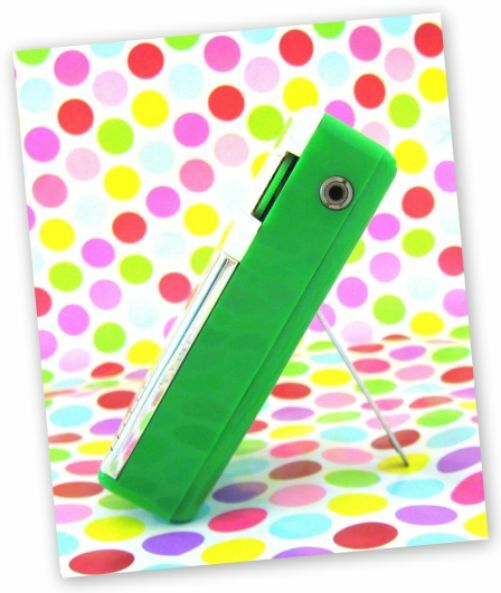 It has a kickstand on the back for lounging and measures 72mm W x 113mm H (2.8" W x 4.4" H). There are plenty of collectors who would love to get their hands on this beauty! I was surprised when I received this radio, it was in really good condition and had been somewhat underrepresented by the previous owner (bad photos and description on the auction site). I didn't even need to strip it in order to clean and polish it as I normally do. 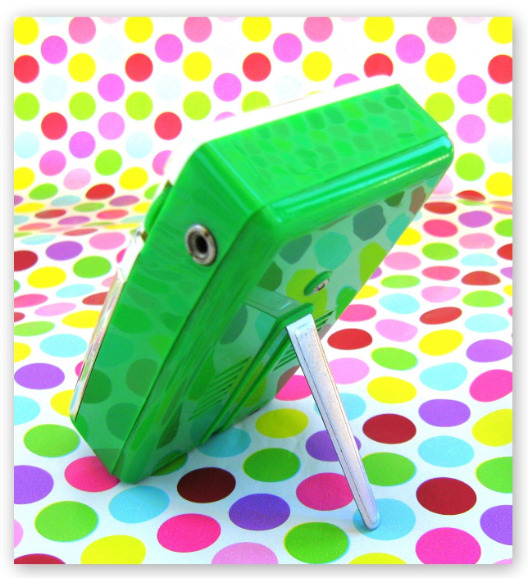 The plastic retains its natural shine and luster, it cant have had much use. It must have spent much of the past 50 years in a dry, dark place; happy times! It comes with a well worn leather case. As per the distributors label this is a 9 TRANSIRTOR RADIO. Look its easy to get your 'R's and 'S's mixed up, happens to the best of us! Collector Bob Davidson points out that this radio shares the same cabinet and chassis layout as the Lafayette FS-91. 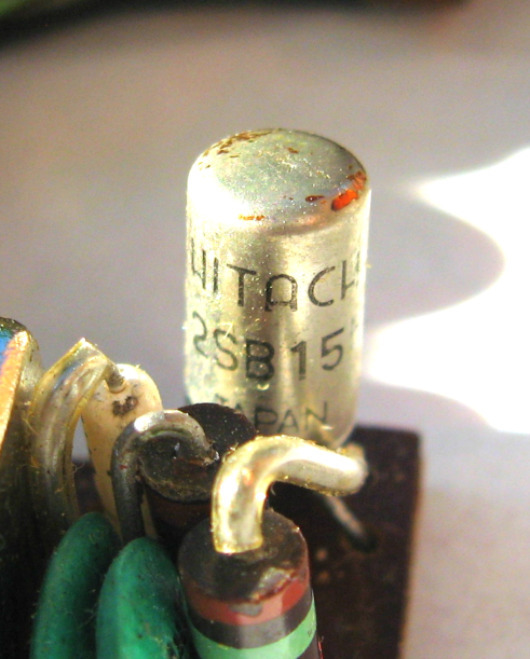 This radio makes use of 9 Hitachi transistors, as does the Lafayette FS-91. 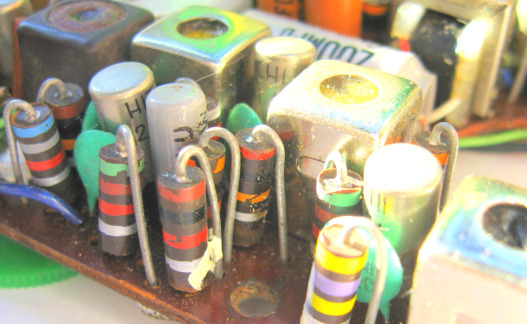 After photographing the circuit board I noticed a partially obscured model number TR-?. This is another clue that points towards either Crown or Sharp being the manufacturer. I'm not going to take this radio apart again to check the number as it is just to risky, the plastic is rather brittle in these old radios. 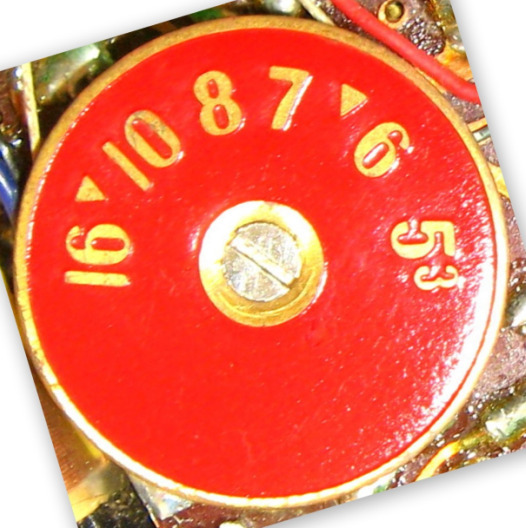 A check of the date code beneath the volume switch (35.01) reveals that this radio was probably manufactured within a couple of months of Jan 1960. For more on dating Japanese radios see Alan Kastners RadioWallah in my links section. 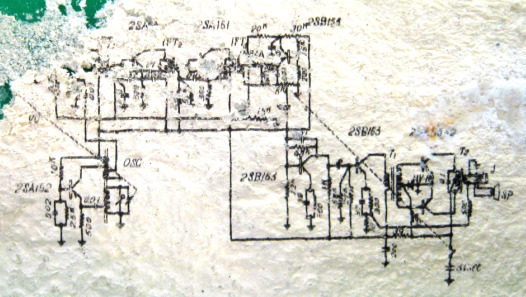 The small schematic diagram inside has been eroded by battery acid. 2007 - 2017 jamesbutters.com by James J Butters. All Rights Reserved.